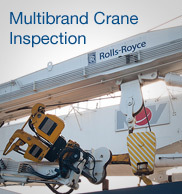 The maritime industry is regulated by international laws, standards and guidelines to ensure the quality of the work performed and especially the safety on board. At Hytek A/S we comply with all applicable laws, and every single employee is approved and certified in accordance with the requirements of their jobs. Our customers’ and employees’ safety is always a top priority, and we feel that our wide range of certifications is an indisputable recognition of the work we do. 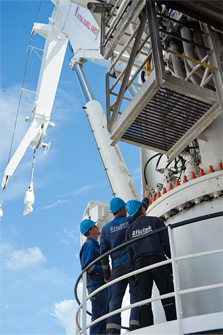 Hytek A/S is a strong and reliable partner servicing the maritime sector as well as a wide range of industries. Innovation and creativity are our watchwords and we take pride in developing solutions that contribute to growth and create results for our customers. Our team includes a wide range of dedicated employees, each with their expertise, with strong competences and great involvement. We believe in education, knowledge sharing and the exchange of experience and we continuously upgrade our skills ensuring that we stay at the cutting-edge – always one step ahead. 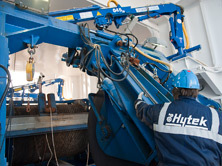 Hytek A/S is situated in the north of Denmark but we are not confined by geography. We offer our services anywhere in the world and have lots of experience in working onsite and across cultures. Our facilities and workshops are at the forefront equipped with cutting edge technology and tools. In case of an emergency or if your inquiry simply demands a fast response, please click here! The fastest way to get hold of us is by phone. Please call +45 9893 6944. Outside our regular opening hours or during public holidays, our 24/7 service personnel will answer your call. Call +45 9893 6944 and press 1 for service. General conditions for sales and delivery, Hytek A/S.